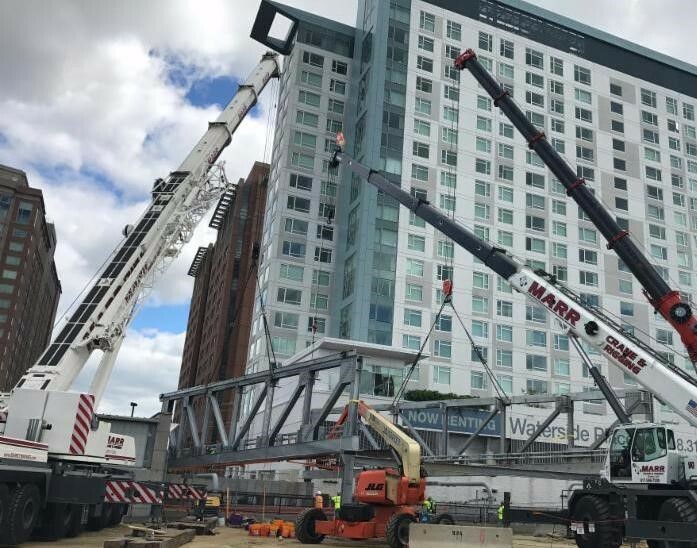 Over two consecutive weekends in June, Daniel Marr & Son Company (DM&S) installed a vehicular bridge and a pedestrian bridge over the Silver Line right-of-way connecting a new 1,500-spot Seaport parking garage (currently under construction) with Congress Street and Waterside Place. Part of the work to develop the new South Boston Waterfront Transportation Center, the bridges will ease connectivity for motorists and pedestrians alike in South Boston’s Seaport District. 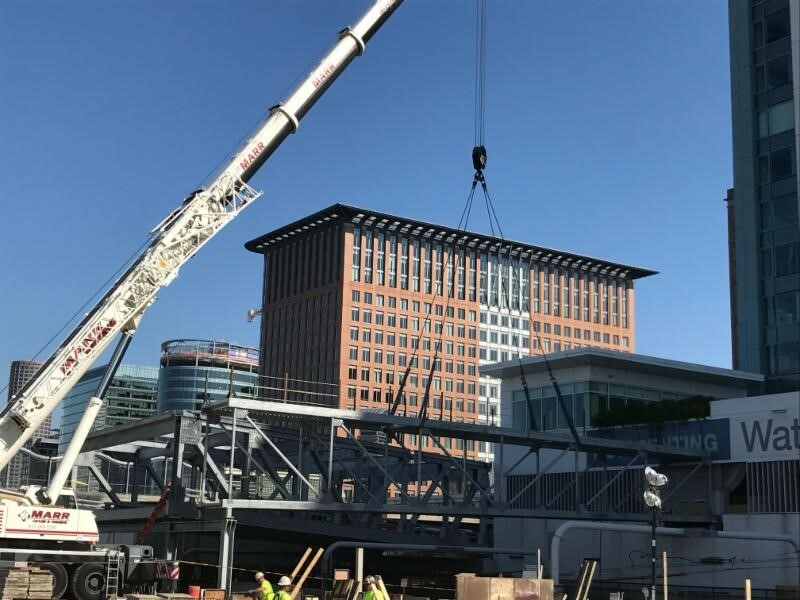 Working for general contractor Skanska USA, DM&S was contracted to install the steel, precast plank and metal deck by fabricator Suncor, Inc. The installation required thoughtful planning and careful execution by crews of skilled ironworkers as the work had to be accomplished when the MBTA could shut down power to the catenary lines located in the work area. Assembled on site, two large trusses were set by separate cranes — a 300-ton and 275-ton hydraulic crane. 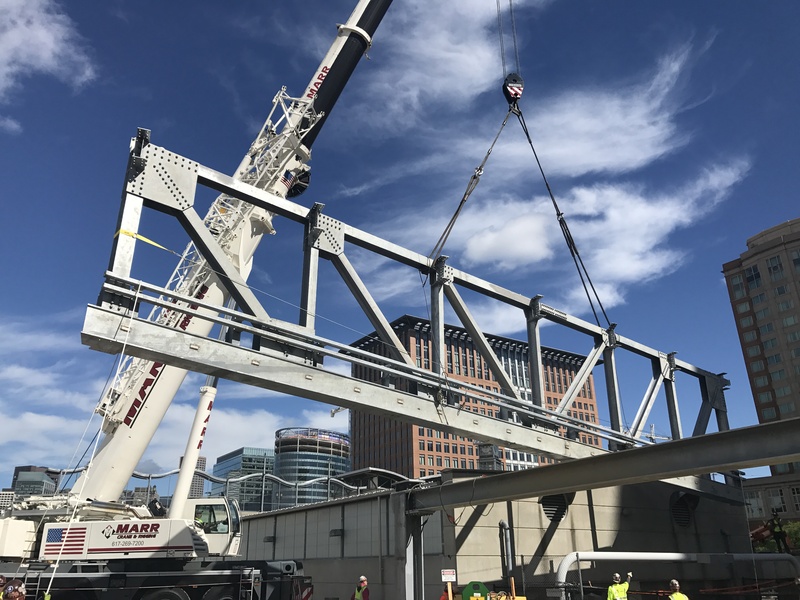 Marr Crane & Rigging provided the 300-ton crane and also the 90-ton crane used to assist in tripping the trusses vertical while temporary and permanent steel was used to tie the trusses together. Once the structure was secure, the 300-ton crane was used to complete the installation of precast planks and roof framing. Marr Scaffolding’s Power Division supplied boom lifts and scissors for ironworkers to safely access the work areas. The pedestrian bridge was pre-assembled in the Marr crane yard. Marr Crane & Rigging coordinated welding axles to the underside of the bridge and attaching a hitch so it could be towed down D Street from the Marr yard to the job site. Transporting the bridge occurred at 2:00 a.m. on a Friday morning and it was set into place during the second weekend of operations. Additionally, completing the bolting, welding and decking of the vehicular bridge took place on the second weekend. The South Boston Waterfront Transportation Center (SBWTC) is a multifaceted Massport project established to fill the need for additional parking and to plan for the area’s broader, future needs. The garage is being constructed over, and supported by, the I-90 tunnel structure built as a part of the Central Artery and Tunnel Project (CA/T).